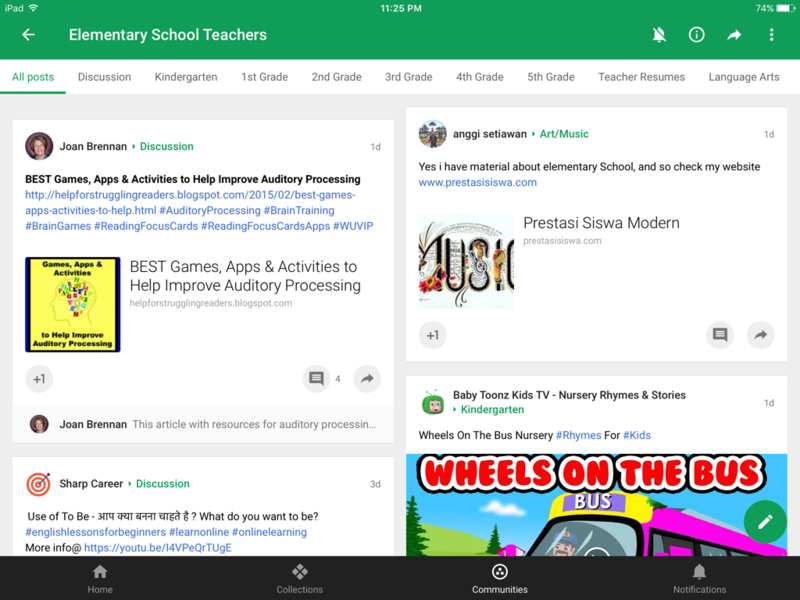 GooGle communities in the classroom! 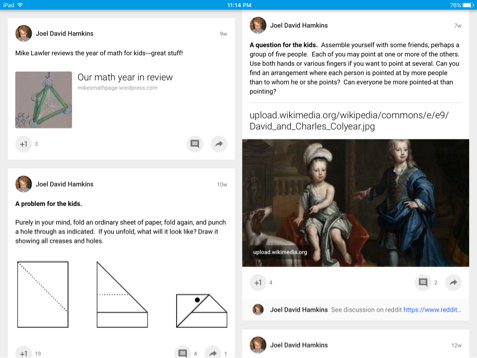 Google+ Communities is a great way for teachers to collaborate and share ideas with each other. The site is full of different groups teachers can join to talk about what they learned, as well as post helpful information that you have learned. The site has communities with games and assignments for different subjects. Teachers from pre-k through 12th grade have resources they can use for their lessons. There are quick and easy ideas for teachers to make accommodations to their lessons the day before. To look at communities similar to what you are looking for, you can search key words such as, "elementary education," and, "elementary math," or "middle school." After searching through the communities under some of these subjects, I liked "Math for Kids" and "Elementary School Teachers." Elementary School Teachers shares activities, games, books, and tools teachers can use as well as resume resources. This is a community we're other people can post and comment. The community has different grade categories, which is very helpful when looking through loads of information. There are over 5,600 members to get ideas from and share. It's pretty unique to see communities like this because it's information from all over. There isn't just one person share it their ideas, but thousands are looking and sharing. Math for Kids was interesting because Joel David Hamkins' post are a collaboration of questions to ask, tasks for hands on learning, examples of lesson ideas, and informational articles. A post that I would consider using in the classroom was about a symmetry idea. He also takes his children's homework and lists creative ideas for other teachers to use. Hamkin also posts websites useful for practicing math for elementary teachers.